FIGURE 1. The coloration of Dragonflies comes in a range of colors but most in our area are brightly colored. FIGURE 3. Dragonflies are voracious predators. Their diet consists a wide variety of insects including flies, mosquitoes, midges and other flying insects. 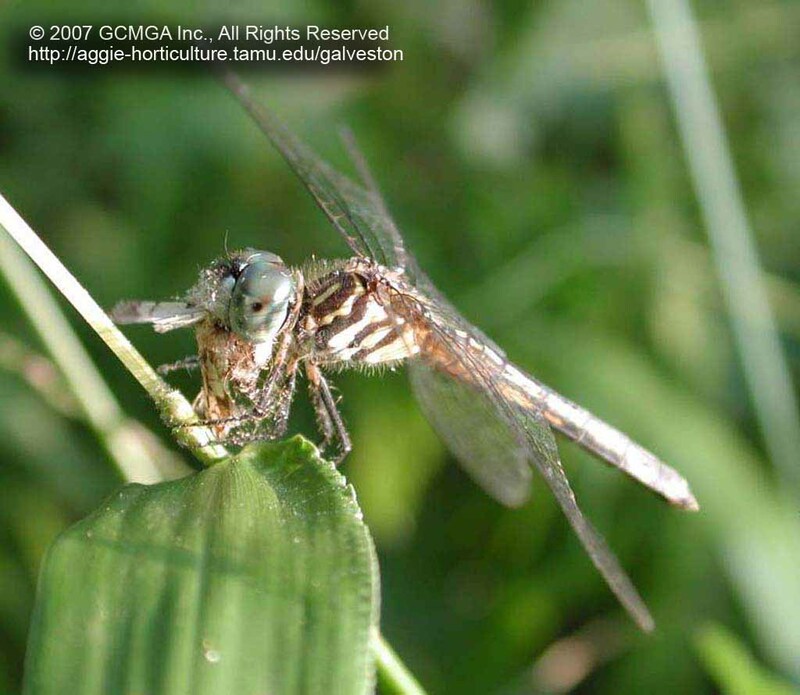 Shown above is a Dragonfly eating a moth that was caught while in flight (note the wings and a portion of the moth�s abdomen can be seen). FIGURE 4. Depending on the species, a female Dragonfly lays eggs in plants near or in water, or directly on the water surface, or on mud at the water�s edge. 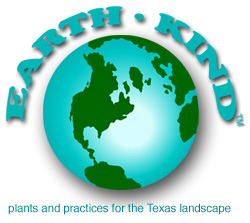 Thanks to Master Gardener Margaret Canavan for this photo! Adults feed on mosquitoes, gnats, flies, swarming ants, swarming termites...just about any flying insect small enough for them to catch. Nymphs feed on aquatic insects, even small fish. Dragonflies are beautiful to watch as they sweep back and forth over open areas of water, lawns, or parking lots. Their bright colors and powerful flight attract our eye to them. They are hunters, like hawks, with good eyesight and great speed. 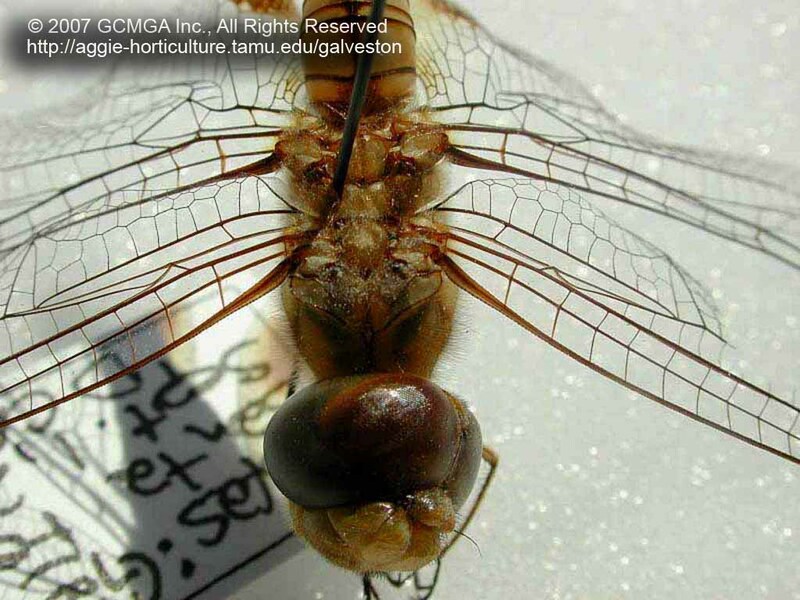 The Dragonfly has eyes that cover most of the head surface and they can fly at speeds of 20-35 miles per hour. 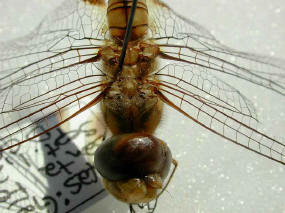 Their prey include mosquitoes and midges as well as moths, butterflies, smaller dragonflies, and other flying insects. Other common names for Dragonflies include mosquito hawks, devil's darning needles and snake doctors. Dragonflies may be confused with their smaller cousins the damselflies. The most recognizable difference is the flight where the Dragonfly is direct and powerful while the damselfly is fluttery. Also, the damselfly�s abdomen is proportionally longer and its eyes are spaced further apart. Both are in the Order Odonata but the Dragonfly is in suborder Anisoptera of the Insect Kingdom. 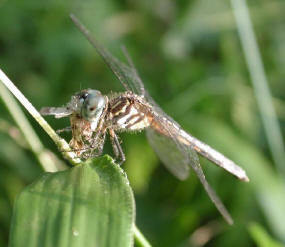 The adult Dragonfly is focused on feeding and mating. The female returns to a wetland area to meet the male. They mate in flight in a wheel formed by their curved bodies. After mating, the female lays eggs in plants near or in water, directly on the water surface, or on mud at the water�s edge depending on the species. Predicated upon on environmental conditions and species, eggs may hatch in as few as 7-9 days or may require several months to hatch. After eggs hatch, the young are generally known as immatures. However, some entomologists identify this stage as nymphs. Other entomologists identify them as naiads but this term is becoming archaic. Immature stages feed on aquatic insect larvae such as mosquitoes, tiny fish and tadpoles. Their main predators are fish and frogs. Again, depending on environmental conditions and species, immatures undergo approximately 10-20 molts, over a time between 3 months and 6-10 years. Immatures then crawl up a vertical plant stem and molt for the final time. The youthful adult fills out its body with fluid and hardens until it can fly. 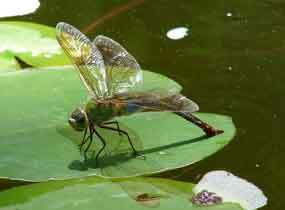 The Dragonfly flies away from the water until it becomes sexually mature. This results in a dispersal where the Dragonfly finds other wetland areas. Perhaps this inherent plan allowed Dragonflies to be one of the most successful creatures on earth. Fossilized remains of large Dragonfly ancestors have been found indicating they were around 300 million years ago. As with many beneficials, providing a suitable habitat is vital to maintaining their populations. Small backyard ponds with some clear surface area, vertical plant stems, and at least partial sun will be colonized by larvae. 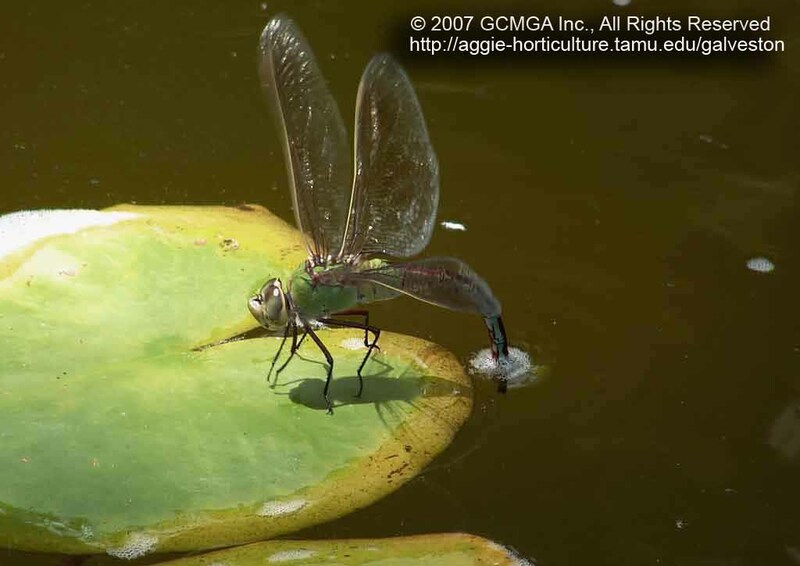 You may already have Dragonfly nymphs in a water garden in your landscape. On a broader note, maintaining wetlands of all types will keep these valuable insects flying in our landscapes and help provide effective control of insect pests!